We offer garments made from our individual design with impeccable craftmanship. We manufacture men’s wear and women’s wear with acute awareness of contemporary trends of the Italian and French fashion. Our clients can choose the garment most suitable for them from different collection of patterns and high quality fabrics. We apply only the highest quality fabrics and employ very experienced tailors attending to detail. The bespoke services are absolutely personalized. 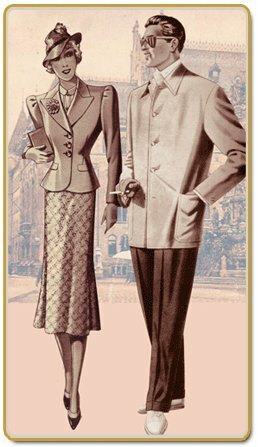 The fashion from the twenties to the fifties, classic man’s and woman’s wear. Classic line with a sporty touch: suits for golf, riding, hunting, yachting and in club version. The self-evident harmony of the forms, creativity and varsatility in the craftmanship. With the garments of the Party Tailoring you can dress with an individual touch at all formal occasions assuring a paramount style for all social or formal event. For those men and women who like classic but not dated style. Exquisite materials, trimmings, accessories, simple lines, handmade garments. We make the clothes to measure by hand, according to the special need and taste of our clients after two or three fittings. We have a close personal contact with our clients and always make sure that the time of the fittings are suitable for them. In case our client would like to have their fittings in their own flat we can organize it a tan extra charge!